Maurice Quilter (31) from Lisselton in Kerry was plucked from the crowd during a concert and gave it socks, much to the audience's delight. "I don't drink so nights out have always been about the music, dancing and enjoying myself. "I have made friends with a good few Africans on nights out and loved their music and style of dance since. "I was in South Africa in September on holiday and I was blown away by all the music and dance we were surrounded by there. I had a great time in clubs in Cape Town and had a great reaction from people there." Maurice went to Africa Day in Dublin on Sunday and was watching a dance demo on stage when the dancer asked if anyone in the audience could do better and Maurice took on the challenge. "My friends started jumping up and down, pointing at me and saying, 'Pick my friend!' so [dancer] David put me on the stage, I reckon thinking that I wouldn't know the music or style of dance. "So when the music started I just went for it. THe reception has been great, all really positive. My Facebook has totally blown up with comments, friend requests and Facebook messages. 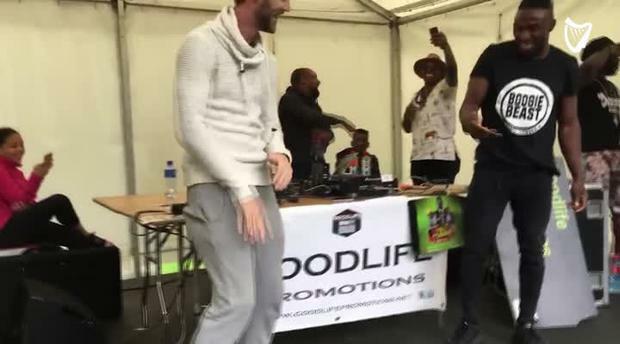 "I'm just glad that the African community here know that there are lots of Irish people here that appreciate their culture and all the music, dance and everything they have brought to us."